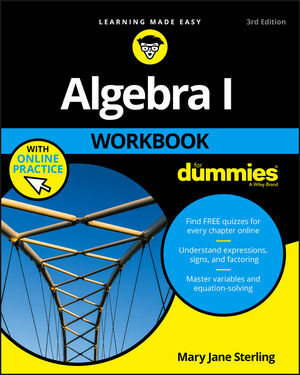 Algebra I Workbook For Dummies is your solution to the Algebra brain-block. With hundreds of practice and example problems mapped to the typical high school Algebra class, you'll crack the code in no time! Each problem includes a full explanation so you can see where you went wrong—or right—every step of the way. From fractions to FOIL and everything in between, this guide will help you grasp the fundamental concepts you'll use in every other math class you'll ever take. This new third edition includes access to an online test bank, where you'll find bonus chapter quizzes to help you test your understanding and pinpoint areas in need of review. Whether you're preparing for an exam or seeking a start-to-finish study aid, this workbook is your ticket to acing algebra. Algebra I is a fundamentally important class. What you learn here will follow you throughout Algebra II, Trigonometry, Calculus, and beyond, including Chemistry, Physics, Biology, and more. Practice really does make perfect—and this guide provides plenty of it. Study, practice, and score high! Mary Jane Sterling taught algebra, business calculus, geometry, and finite math-ematics at Bradley University in Peoria, Illinois, for more than 30 years. She is the author of Algebra I For Dummies and Algebra II For Dummies.